Who doesn’t want to earn money online right? Websites and blogs have become a major part of the technological revolution. Even little kids these days are coming up with ideas on how to make great blogs and websites which they can show off to their classmates. Out of the millions of websites currently existing on the Internet, only a small percentage make decent revenue off of them. As avid Internet users we all know how the Internet runs, it runs on ads. An advertisement is a crucial ingredient required to make a website profitable. It is not just that a site should provide excellent service to its followers, it should also be able to make money out of it, in order to keep offering its great content. Making a decent profit is especially tricky if your site is not compliant with Google AdSense. But since there are so many ad networks out there, it makes it easier to earn some money along the way. Today I will be talking about Ad-Maven, which is one such ad network. It is a unique premium ad network that can assist bloggers and publishers to earn money through pop ads and other ad formats. The two best features about Ad-Maven is that publishers are provided with detailed reports about their earnings and each publisher is assigned with a friendly account manager. The account manager can advise users on how to manage their accounts better and potentially earn more money. 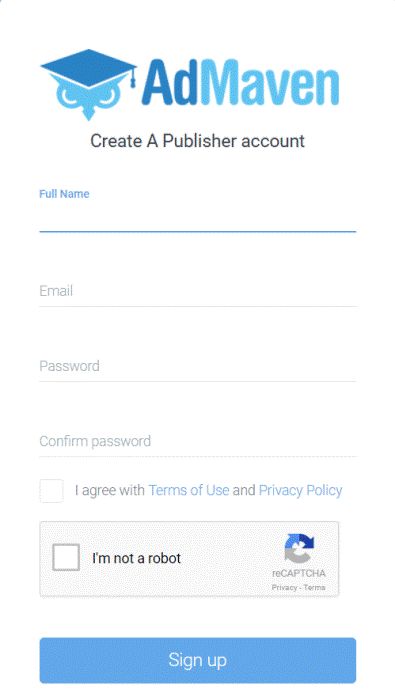 The signup process is extremely simple, just enter your full name, email address and password and you are good to go. Once your account is ready, you will have the option to add your websites that you want to run ads on and create ad units that will run on those sites. This process is once again extremely straightforward and easy to use. The websites can be added under the site management tab. Once the added site approved, publishers can easily create tags (also known as Ad units). So there are pop, lightbox, interstitial and banner VPN ads. There are also other formats such as buttons and banners. So the next question is which ad you should use. Well, it all depends on the type of traffic you have and also on the amount of traffic you have along with the traffic location. There is no exact science to this, so you can try out all of them and see which one works for you the best. They follow the NET-30 system, that is payment is sent 30 days after you earn it. This can also vary on how your website is performing. Ad Maven also offers an equally good advertising solution for businesses to help advertisers expand their online visibility, boost sales figures and increase profits. If you want to advertise your business, you have to first sign-up “AS AN ADVERTISER” and then follow the processes to start using the network. The manager assigned to advertisers is extremely helpful. They can guide advertisers from the first step, and even businesses who do not know how to set up ads can do so in a matter of few moments. The managers will help advertisers become familiar with the ad network so that they can tweak it to their own liking. The traffic provided by Ad-Maven is quite brilliant as all of the publisher sites added to the Maven network are first approved by the Ad-Maven team. This process rejects all low-quality sites leaving users only with good healthy pages. Ad-Maven also comes with the advantage of push notification for advertisers and publishers. Native Push Notifications by Ad-Maven are a great way of reaching customers. They can be annoying but if executed the right way, they can bring more conversions to one’s business. Ad-Maven’s native push notifications are designed to bring more revenue with other advantages for both advertisers and publishers. Ad-Maven’s “Native Push Notification” service that allows you to target content that users want to see. When a user opts-in to receive the notifications of your website, they get a notification, and on clicking that notification, the user gets redirected to a particular page. It’s also an easy way to send customized messages on the desktop and mobile devices. For publishers, it takes two minutes to integrate push notifications in your website. It increases revenue with minimal website real estate. Native push notification service is user-friendly and compliant with the format of sites. It is a fully customizable format with a reach of over 150 million daily active users. It also offers high CTR, performance-oriented format (CPC), and after click performance. So, if you are planning to run ads, this process can really make you stand out from the crowd. So all in all, Ad Maven is a great ad traffic network that should not be missed out on. Pushy Ads Network Review – Why it’s a better option? Adsterra Review – The Best International Ad Network? Next Post What Marketing Do Customers Take Notice Of?